Flora Smith Amussen Benson was the wife of Ezra Taft Benson, thirteenth president of The Church of Jesus Christ of Latter-day Saints. Flora was born on July 1, 1901, in Logan, Utah. Her father, Carl Christian Amussen was a Danish jeweler, watchmaker, dentist, and businessman. He died when Flora was only fifteen months old (he was seventy-seven). She graduated from Brigham Young College in Logan and did post-graduate studies at Utah State Agricultural College, where she met President Benson. They dated until he went on his mission to England. She was girls singles tennis champion, a prize-winning Shakespearean actress, president of the girls athletic club, and vice president of the college student board. When President Benson completed his mission, she wanted to also serve a mission before she married. She served in the Hawaiian Mission for twenty months, at one time serving with her mother who had also been called to serve in Hawaii. She and President Benson married on September 10, 1926. She had inherited from her father stocks and substantial dividends, but turned them over to her widowed mother and chose to start her married life “at the bottom.” They spent the next year in Ames, Iowa, where President Benson worked to earn his master’s degree at Iowa State College. She also took courses in home economics. She supported her husband while he was a farmer in southern Idaho and U.S. secretary of agriculture. She had her own duties in Washington, D.C. and attended his press conferences. In 1943, they returned to Utah when he was called to serve in the Quorum of the Twelve Apostles. They were the parents of six children. 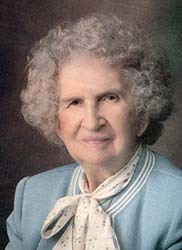 She devoted her life to her career as wife, mother, and homemaker. In 1955 she was named Homemaker of the Year by the Washington, D.C., chapter of the National Home Fashion Magazine. She received the Distinguished Achievement award from Ricks College in 1969, in the mid-1980s was named Lambda Delta Sigma Woman of the Year for her love of family and church, and in 1992 she was honored with Brigham Young University’s Exemplary Womanhood award. She passed away on August 14, 1992. He died on May 30, 1994. This page was last edited on 1 February 2017, at 13:56.